Arsenal v Tottenham Stats – Immovable object meets unstoppable force? We are leading up to an incredible game when Tottenham visit the Emirates knowing they have an awful record away at Arsenal. But they are also on an incredible run of form too having won their last five away games, and are going to be far from easy to beat but are they unstoppable? But, then again, Arsenal haven’t lost to anyone after their first two games of the season, despite not being at the top of their game, so are they unbeatable? Arsenal beat Tottenham 2-0 at the Emirates last season, but that is their only win in their last eight league games against Spurs (D4, L3). Spurs have only won one of their last 25 top-flight games away to the Gunners (D10, L14), with their solitary success a 3-2 victory in 2010. Tottenham have dropped 37 points from winning positions in Premier League games against Arsenal – the worst record of any club against a single opponent. Arsenal have scored in each of their last 22 home games against Tottenham in all competitions, last failing to find the net against them in a 0-0 draw in November 1998. 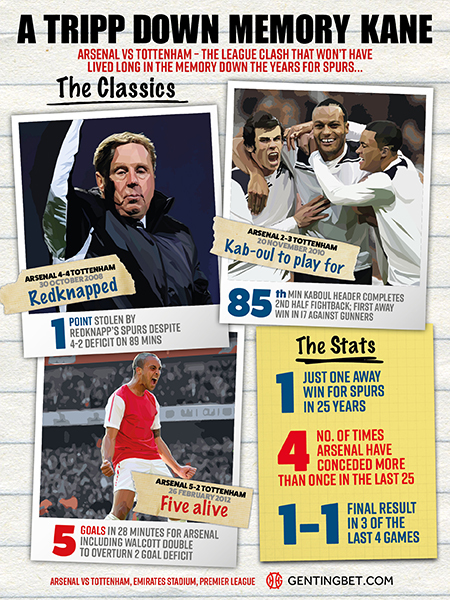 The sides have met 195 times in all competitions, with Arsenal leading by 81 wins to Tottenham’s 63. The Gunners are unbeaten in their last 11 league games (W8, D3), with their most recent defeat coming at Chelsea in August. Arsenal have won three of their last 28 league games against other sides from the established top six (D10, L15). Only two of the last nine Arsenal managers (including caretakers) have won their first league game against Spurs – Don Howe in 1983 and Arsene Wenger in 1996. Arsenal are one of only two teams yet to lead at half-time in a Premier League match this term (alongside Cardiff) – though the Gunners have gone on to win eight of those 13 fixtures. Unai Emery’s side would be 18th if games ended after 45 minutes, and second (two points behind Manchester City) if only second-half goals counted. Pierre-Emerick Aubameyang has scored with his last eight shots on target in the Premier League – the last keeper to save one from him was West Ham’s Lukasz Fabianski in August. Victory would give Tottenham their highest-ever points total after 14 games of a Premier League season, while a draw would mean they equal their best haul of 31 points in the 2011-12 campaign. Tottenham have won seven consecutive league games against London rivals, one short of the club record in the top flight (set from October 1950 to August 1951). Victory would also see Spurs equal a club record by claiming six consecutive Premier League away wins. Harry Kane has scored seven goals in seven Premier League games against Arsenal, only failing to net against them in one appearance (the corresponding fixture at the Emirates last season). Kane is one shy of equalling the record for most Premier League goals in north London derbies, held by Emmanuel Adebayor. So, as everyone always says, stats and form mean nothing when it comes to a derby as big as this, but Arsenal ALWAYS seem to dig deeper, because we are the KINGS OF NORTH LONDON! This entry was posted in Arsenal News, Arsenal NewsNow on December 1, 2018 by Admin. What does this even mean? Is football now about who is better at predicting how the other team would play? Some of the best teams in the world are predictable in terms of how they play but they still win. For us to win against spurs, we need to defend better than we normally do, be clinical and make sure we are ready to fight for the win; no passengers. Head to head stats are irrelevant and I am amazed that anyone who considers themselves intelligent can even worry about them. They are about the past , not the present and are therefore about as relevant to todays team as tape for crossbars, used before wooden ones came in. Just a mere moments thought, which is seemingly way beyond many fans, can see the absurdity of “not won since 1979” and that sort of comments, which would include such of our players as Alan Sunderland, who many have never even heard of, unless they are either old enough or true fans enough to have studied their Arsenal history properly, as young true fans would be expected to have done , were they REAL fans, in the first place. I am appalled that there are young fans on here who claim to be devoted Arsenal fans but who know nothing or practically nothing of ANYTHING Arsenal wise before Wenger came. THAT is not being a true fan. And it is not intelligent to think that any past years results are remotely relevant to tomorrows game either, as they are not. The capacity that so many fans from ALL clubs have to fool themselves never ceases to amaze and appal me. I will be submitting an article on on this site about precisely this subject of widespread fan dishonesty(to ourselves) and would welcome comments please. We all support – or claim to, in some cases – Arsenal Football Club , which is 132 years old this year and has a long and glorious history and is about so much more than MERELY today. The history of the club is important but not the past stats and results? How can you even say something like that and believe it? A team’s past performances and results are as much of their history as anything else, if not more so? Aspects of a club’s history obviously has a direct correlation to their results during the same period.